Lama Lena (Yeshe Katyup), the long time student and translator of Lama Wangdor Rinpoche, visited us on 20-22 June, for our first formal teaching in the new practice space. She blessed the lokapalas (local spirits) of the area, and proceeded to teach on the tsiksum nedek, or the "Three Incisive Points"-- the last testament of Garab Dorje. Garab Dorje, the first dzogchen master of the human realm, gave this teaching to his heart disciple Manjushrimitra, posthumously after having attained the rainbow body. The three points of this testament are the quintessence of the view, path and fruit of dzogchen. Wangdor Rinpoche himself gave this teaching last year, following Patrul Rinpoche's commentary "The Special Teachings of the Wise and Glorious King". With the same directness, humor and practicality, Lama Lena taught from the same text. The group was quite small, so we were able to receive individualized instruction and ask many questions. 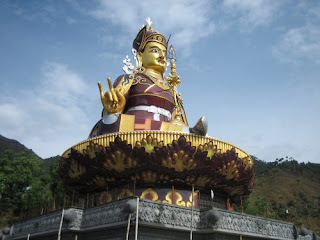 Lama Lena informed us that Lama Wangdor Rinpoche's 108 foot statue of Guru Rinpoche is completed and that they are working on the temples and shrines in the platform of the statue. Lama Wangdor Rinpoche, like Lho Ontul Rinpoche, the founder of the Drikung Dzogchen Communties, is based at Tso Pema. Tso Pema is a holy site to Sikhs, Hindus and Buddhists. In the Vajrayana tradition, Tso Pema-- the "Lotus Lake"-- is the site where Guru Padmasambhava and Mandarava were set afire, to arise on a lotus in a lake. For Lama Wangdor Rinpoche's activities look here.